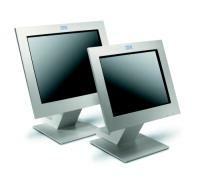 The IBM 4820 10″ Display Model 10D is a display only monitor designed to attach to a 4694 Point of Sale Terminal system via the industry-standard analog video port. It attaches to the SurePOS 700 system using the analog DVI-I video port. It is a great solution when a space-saving 10″ high performance monitor with no additional I/O support is needed. The display covers are IBM Pearl White and are color-matched with other I/O devices that attach to an IBM 4694 or SurePOS 700 system unit.